Riyadh, 5th July 2018: More than 100 senior industry leaders from the private and public sectors as well as noted KSA academia attended the graduation ceremony of the inaugural class of 50 Qimam Fellows yesterday. They commended the quality of Saudi talent represented by Qimam’s inaugural fellowship and the rigorous program that helped develop their leadership skills and build their network. Launched in February 2018, the Qimam Fellowship Program attracted more than 13,000 applications. Of these, 150 applicants were invited to Riyadh for two in-person interviews conducted by more than 50 senior leaders from the public and private sector. Based on the interview outcomes, an admissions committee comprising members of Qimam’s partner companies selected 50 students as Qimam Fellows. Mentorship with 3 senior leaders recognized for their outstanding professional track records to help fellows with personalized career advice, training by world class experts in critical skills to help them succeed in their careers, visits to leading public and private sector organizations to engage with their leadership and learn about how they operate, networking and team-building to help them build long-lasting relationships, and sharing the fellow profiles on the Qimam website and with HR professionals across the Kingdom for career opportunities. 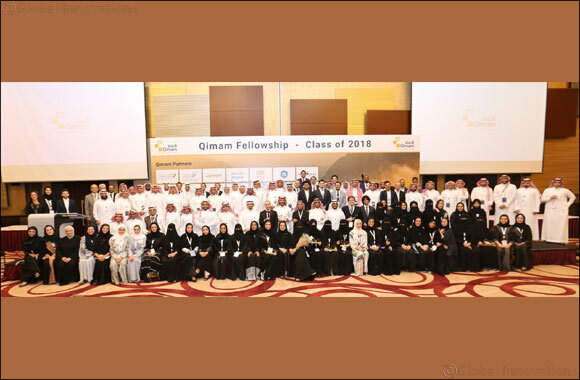 At the graduation ceremony, the 50 fellows were presented with the ‘Qimam Award for High-Potential Leaders,’ an honour bestowed by Qimam and its partners to recognize their achievement and distinction. More than 100 senior leaders who helped select and mentor the fellows. 14 corporate partners (Al-Khaleejiah Advertising & Public Relations Company, AlTayyar Travel Group, Careem, Cisco, Bab Rizq Jameel, General Electric, Saudi Arabian Mining Company “Ma’aden', McKinsey & Company, Oqal, Pearson, Saudi Telecom Company - STC, Rocket Internet, Aberkyn, and SMAAT), who trusted and supported the program from day one. 13 large Saudi organizations opened their doors to Qimam Fellows so they could learn more about them and engage directly with their leadership (Adaa – National Center for Performance Measurement, Al-Khaleejiah Advertising & Public Relations Company, AlTayyar Travel Group, Banque Saudi Fransi, Careem, Cisco, General Electric, King Fahad Medical City, King Faisal Specialist Hospital & Research Centre, King Khalid Foundation, Ma’aden, McKinsey & Company, Saudi Telecom Company - STC). McKinsey & Company, who took the idea under its wing by providing strategic guidance, the funding required to set it up and operate it, and a full-time operational team that supported it throughout the whole process. AlTayyar Travel Group, Qimam’s official travel partner, covered all travel related expenses of the program (including flights of students to the interviews and the training, the venue of the in-person interviews in Riyadh, accommodation of fellows during the training, transportation during the training program, and the award ceremony).